Welcome to Hotel Malom Kiskunfélegyháza! At our wheelchair-accessible hotel we offer you the comfort of your home with a full service. We are the best choice if you need clear and friendly accommodation at a moderate price in Southern Hungary. 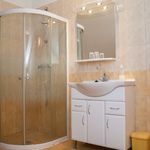 All our rooms have a bathroom with shower, television with international channels, and free Internet-connection facility. Cold buffet breakfast, Internet-corner and fitness facility are included in the room rates. Bathing and wellness services are available at Thermal Bath Kiskunfélegyháza. The total capacity of the room is 2 adults. With children under the age of with children under the age of 4, max. 3 people guests can be placed in the room. The rating of Malom Hotel Kiskunfélegyháza is 8.5 from the maximum of 10, based on 93 real guest reviews. "Staff speaks NO english, contrary to website announcement. Shower gives little water Room was smelly and hot Room was to the road, so you could loudly hear every car passing No good place for safely putting the bicycle. Room is (I think) smaller than advertised." "For its price it is not bad."